The Rocky Mountain battle royal between Alberta and B.C. isn’t just about pipelines or wine, it’s about winning the fight for the hearts and minds of Canadians. And in the PR campaign between two western neighbours over the Trans Mountain pipeline, the prize — Canadian public opinion — remains up for grabs. 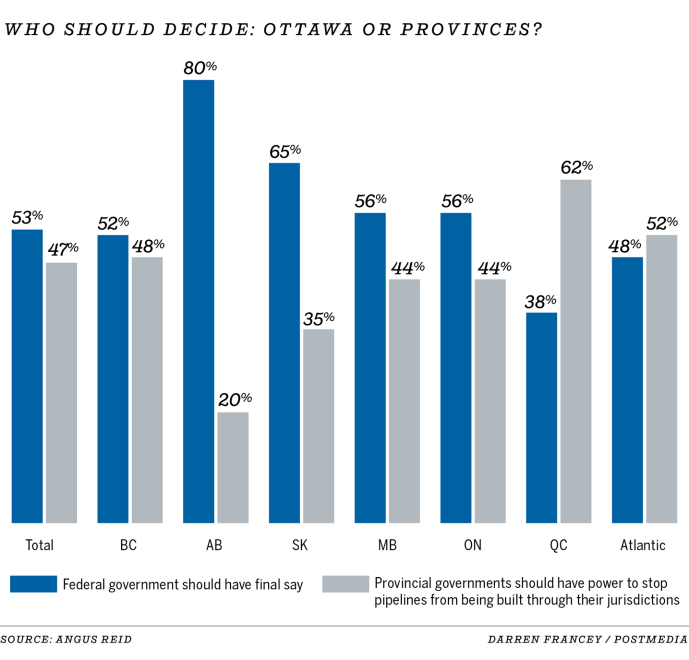 A new poll by the Angus Reid Institute shows the interprovincial fracas over the Trans Mountain pipeline expansion has left Canadians deeply divided. 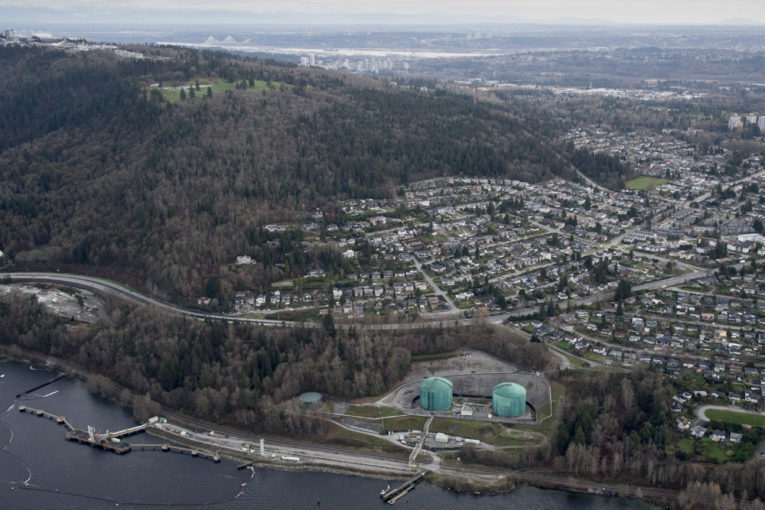 On the key question of support for Kinder Morgan’s project that will triple oil shipments from Alberta to the Pacific coast, more Canadians back the development than oppose it. Some 49 per cent of Canadians say they strongly or moderately support the pipeline, while one-third are opposed. The rest are not sure. In Alberta, it’s not even close as more than three-quarters of residents favour the $7.4-billion project. Even in British Columbia, 48 per cent back the pipeline’s expansion, while 40 per cent are opposed. In all other regions of the country, more people support the project than oppose it, except in Quebec. If this were the only question, the Alberta and the Trudeau governments would walk away with a victory and smiles etched on their faces. However, the public relations fight is much tighter when Canadians consider each province’s arguments. B.C. Premier John Horgan insists his government is concerned the pipeline expansion will boost tanker traffic off the Pacific coast and could increase the risk of a significant spill. Premier Rachel Notley has made the economic case that the project is about jobs and maximizing the return for a key Canadian resource. On Tuesday, Scotiabank said inadequate pipeline capacity in the country will slice $10.8 billion in revenues from the energy sector this year. So which side is winning? When asked which province’s argument is more persuasive, it’s a dead heat with each side at 50 per cent — and each side having allies across the country. “The idea of pipelines being a divisive issue in this country is a bit of a cliche until you see these results,” said pollster Shachi Kurl. Among the provinces, 82 per cent of Albertans and 70 per cent of Saskatchewan residents find the Notley government’s argument more persuasive. A slim majority also exists in Ontario. Almost two-thirds of Quebecers, 58 per cent of B.C. residents and 55 per cent of respondents in Atlantic Canada believe Horgan’s argument wins the day. It’s like a tied hockey game, filled with cross-checking and fights, now headed for overtime. Despite the deadlock, the poll still finds 55 per cent of Canadians think the B.C. government is wrong to try to delay the federally approved pipeline expansion, while 45 per cent say it’s right. Even in B.C., a slight majority — 52 per cent — believe the Horgan government is wrong to rag the puck and delay Trans Mountain. “This is a complicated and conflicted issue and one that raises some conflicts in the minds of Canadians,” said Kurl, the institute’s executive director. It’s also a highly charged issue. Since the B.C. government announced last month it would seek feedback on proposed regulations to restrict additional shipments of diluted bitumen through the province, Alberta has fought back. It has banned B.C. wine imports and is contemplating further retaliation. Notley insists the feud is not between Alberta and B.C., but between Horgan’s government and the rest of Canada because Ottawa alone has the constitutional authority to approve and regulate cross-border pipelines. For the public, it’s not quite so clear-cut. A slim majority, 53 per cent, say the federal government should have the final say on such energy projects, while 47 per cent say the provinces should. There’s little doubt Notley has strong support within Alberta for her pipeline stance. The situation is more delicate in B.C., where Horgan’s government is in an alliance with Andrew Weaver’s Green party. In B.C., roughly six in 10 residents on Vancouver Island and in metro Vancouver find Horgan’s argument more persuasive. In the rest of B.C, 51 per cent side with Alberta’s point of view. More than eight in 10 Alberta respondents said the Notley government’s argument was more persuasive, with the results overwhelming regardless of where people live. The online poll of 2,501 Canadians was conducted between Feb. 15 and Feb. 19 and included 500 residents each in Alberta and B.C. You can download it here. Like all barometers of public opinion, it’s only a snapshot in time, yet it helps explain why a public relations war is now unfolding. The Alberta government spent $62,000 to run advertisements in B.C. newspapers on Wednesday, with a map of Canada that shows the coastal province pulling away from the country. In B.C., Horgan has benefited from a “rally-around-the-flag” mentality that occurs when provinces battle Ottawa or each other, said political scientist David Moscrop at Simon Fraser University. It also keeps his alliance with the Green party from pulling apart, while speaking to NDP supporters in the Lower Mainland who staunchly oppose oil pipelines. “In some senses, it’s a stalemate, but the stalemate serves John Horgan … and Kinder Morgan is caught in the middle,” he said. In Alberta, Notley is ramping up the pressure and saying more action against B.C. is coming if the issue isn’t resolved quickly. She’s hoping the Trudeau government will do what’s necessary to keep the project moving ahead. “Her audience is the rest of Canada. She already has Alberta on her side,” said political analyst David Taras of Mount Royal University.